Since the discovery of carbon nanotubes (CNTs) in 1991 by Iijima, a whole new discipline in materials science has developed, Nanoscience. Hundreds of millions of dollars have been invested trying to unlock the secrets of these revolutionary materials. These functional nanoscale materials have a variety of unique, fascinating, and never seen before properties. In fact, a 4th state of matter was recently discovered as water trapped inside a carbon nanotube doesn’t act as a solid, liquid, or gas. 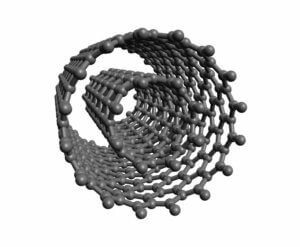 Our carbon nanotubes overview is designed to give the reader an in depth understanding of these amazing materials. On a molecular level, CNTs are 100 times stronger than steel at one-sixth the weight and have a very large aspect ratio making them very useful as a mechanical property enhancing filler material. Carbon Nanotubes conduct heat and electricity similar to copper but without oxidative concerns provided that they are well dispersed. 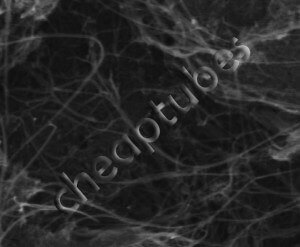 Carbon Nanotubes have already found commercial applications in the fields of engineering plastics, polymers, displays, anti corrosion paints, thin films and coatings, transparent and non-transparent conductive electrodes, super hydrophobic coatings and anti-static packaging while active research is on going in fields such as batteries, fuel cells, solar cells, advanced devices, optics, water desalination and many others. 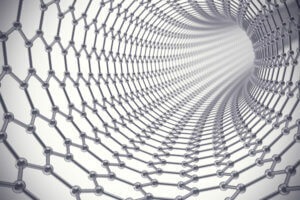 Carbon Nanotubes paved the way for Graphene. Being a tube-like material. an allotrope of carbon, and having a diameter measuring on the nanometer scale make CNTs a truly revolutionary material. A nanometer is one-billionth of a meter which is about 10,000 times thinner than a human hair. CNTs are unique due to the strong inter-molecular bonds between the alternating 5 and 6 membered rings of carbon atoms. Van der Waals forces present within carbon nanotubes make them prone to agglomeration/re-agglomeration and achieving good dispersion can be challenging due to those forces as well as their high aspect ratio and high degree of entanglement with other CNTs. 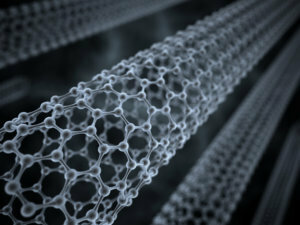 Carbon nanotubes have can have different structures, lengths, thicknesses, and number of layers. Carbon nanotubes are available as single walled carbon nanotubes, double walled carbon nanotubes, or else as multi walled carbon nanotubes. The structure of a single walled carbon nanotube can best be visualized as the wrapping of a one-atom-thick layer of graphite called graphene into a seamless, tube-like cylinder even though they are grown as a tube and not as a sheet which is later rolled up. A structural pattern emerges from the way that the graphene sheet is wrapped which is represented by a pair of indices (n,m). The integers n and m denote the number of unit vectors along two directions in the honeycomb crystal lattice of the carbon nanotubes. If m = 0, the nanotubes are called zigzag nanotubes, and if n = m, the nanotubes are called armchair nanotubes. Otherwise, they are called chiral. Double walled carbon nanotubes have one concentric nanotube inside another nanotube. Most SWNTs on the market, if made by CCVD contain DWNTs as well. The electronic characteristics of nanotubes can be different depending on the chiral angle of nanotube as it was grown during synthesis which causes it to act as either semiconducting or metallic material. They are typically grown as sold as mixed structures. Semiconducting and metallic single walled carbon nanotubes can be successfully isolated by density differentiation. The process uses chemicals to create a density gradient and the isolated carbon nanotubes gather in specific regions by type which can then be harvested as an isolated material. The graphene layer that makes up the nanotube can best be envisioned as a rolled-up-chicken-wire-like structure consisting of alternating five and six membered hexagonal rings of carbon atoms. Their structure is determined by the specific synthesis conditions which rarely produce a homogeneous product as they are usually mixtures of the different types of CNTs produced in a given reaction. Carbon nanotubes history is perhaps as fascinating as the nanotubes themselves. In 1980 we knew of only three forms of carbon, namely diamond, graphite, and amorphous carbon. Today we know there is a whole family of other forms of carbon. The first to be discovered was the hollow, cage-like buckminsterfullerene molecule – also known as the buckyball, or the C60 fullerene. There are now thirty or more forms of fullerenes, and also an extended family of linear molecules called carbon nanotubes. 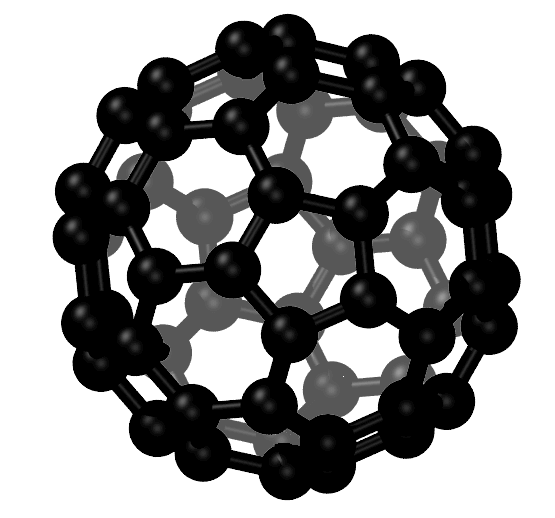 C60 is a spherical carbon molecule, with carbon atoms arranged in a soccer ball shape. In the structure there are 60 carbon atoms and a number of five-membered rings isolated by six-membered rings. The second, slightly elongated, spherical carbon molecule in the same group resembles a rugby ball, has seventy carbon atoms and is known as C70. C70’s structure has extra six-membered carbon rings, but there are also a large number of other potential structures containing the same number of carbon atoms. Their particular shapes depend on whether five-membered rings are isolated or not, or whether seven-membered rings are present. Many other forms of fullerenes up to and beyond C120 have been characterized, and it is possible to make other fullerene structures with five-membered rings in different positions and sometimes adjoining one another. An important fact for nanotechnology is that useful dopant atoms can be placed inside the hollow fullerene ball or carbon nanotube to tune it’s performance for specific applications. Atoms contained within the fullerene are said to be endohedral. Of course they can also be bonded to fullerenes outside the ball as salts, if the fullerene can gain electrons. 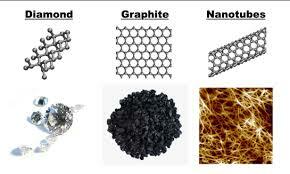 Possibly more important than fullerenes are carbon nanotubes, which are related to graphite. The molecular structure of graphite resembles stacked, one-atom-thick sheets of chicken wire – a planar network of interconnected hexagonal rings of carbon atoms. In conventional graphite, the sheets of carbon are stacked on top of one another, allowing them to easily slide over each other. That is why graphite is not hard, but it feels greasy, and can be used as a lubricant. 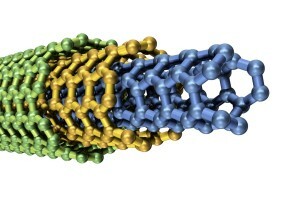 When graphene sheets are rolled into a cylinder and their edges joined, they form CNTs. Only the tangents of the graphitic planes come into contact with each other, and hence their properties are more like those of a molecule. Endohedral fullerenes can be produced in which metal atoms are captured within the fullerene cages. heory shows that the maximum electrical conductivity is to be expected for endohedral metal atoms, which will transfer three electrons to the fullerene. Fullerenes can be dispersed on the surface as a monolayer meaning there is only one layer of molecules, and they are said to be mono dispersed. Provided fullerenes can be placed in very specific locations, they may be aligned to form a fullerene wire. 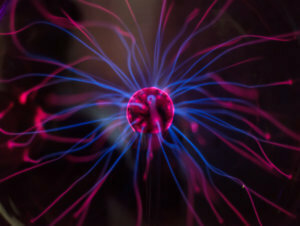 Rice University recently demonstrated Teslaphoresis, using a Tesla coil to self-align carbon nanotubes into a filament. Systems with appropriate material inside the fullerene ball are conducting and are of particular interest because they can be deposited to produce bead-like conducting circuits. Combining endohedrally doped structures with non-doped structures changes the actual composition of a fullerene wire, so that it may be tailored in-situ during patterning. Within a single wire, insulating and conducting regions may be precisely defined. One-dimensional interconnects engineering becomes realistic with fullerenes. Carbon nanotubes come in a variety of diameters, lengths, and functional group content which can tailor their use for specific applications. CNTs are available for industrial applications in bulk quantities up metric ton quantities. Several CNT manufacturers have >100 ton per year production capacity for multi walled nanotubes. A nanotube may consist of one tube of interconnected graphite atoms, a one-atom thick single-wall nanotube, or a number of concentric tubes called multiwalled nanotubes. When viewed with a transmission electron microscope these tubes appear as planes. Whereas single walled nanotubes appear as two planes, in multi walled nanotubes more than two planes are observed, and can be seen as a series of parallel lines. There are different types of CNTs, because the graphitic sheets can be rolled in different ways. How they are rolled is known as the chiral angle. The three types of CNTs are Zigzag, Armchair, and Chiral. It is possible to recognize zigzag, armchair, and chiral CNTs just by following the pattern across the diameter of the tubes, and analyzing their cross-sectional structure. Multi walled nanotubes can come in an even more complex array of forms, because each concentric single-walled nanotube can have different structures, and hence there are a variety of sequential arrangements. The simplest sequence is when concentric layers are identical but different in diameter. However, mixed variants are possible, consisting of two or more types of concentric CNTs arranged in different orders. These can have either regular layering or random layering. The structure of the nanotube influences its properties – including electrical and thermal conductivity, density, and lattice structure. Both type and diameter are important. The wider the diameter of the nanotube, the more it behaves like graphite. The narrower the diameter of the nanotube, the more its intrinsic properties depends upon its specific type and is where their properties can be used in new and innovative ways. Multi-walled carbon nanotubes (MWNTs) consist of multiple nanotubes inside larger nanotubes with the same and different chiralities. You can even have semiconducting and metallic regions on the same individual nanotube structure. Two models best describe the structure of multi-walled carbon nanotubes, the Russian Doll and Parchment models. Russian Doll model carbon nanotubes are quite literally tubes inside of larger tubes much like the popular children’s toy name would suggest. Parchment MWNTs features a single sheet of graphite is rolled around itself, resembling a scroll of parchment or a rolled up newspaper. The interlayer spacing is close to the distance between the individual graphene layers in graphite, approximately 3.4 Å. The Russian Doll structure far much more common. 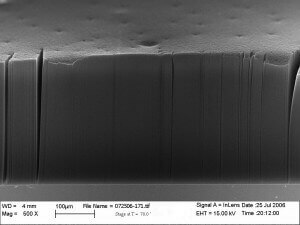 Vertically aligned carbon nanotubes are produced by CCVD and are adhered to the synthesis substrate which is typically Si/SiO2 or stainless steel or copper foils. They can be grown by CCVD or PECVD in a top down or bottom up synthesis method. The CNTs can be used while on the array or else removed and used free standing. Some applications such as super capacitors use a roller to flatten the array to make a conductive layer in the device. Some CNT arrays are drawable meaning they can be directly drawn and spun into fibers. There are a number of methods of making CNTs and fullerenes. Fullerenes were first observed after vaporizing graphite with a short-pulse, high-powered laser, however this was not a practical method for making large quantities. CNTs have probably been around for a lot longer than was first realized. They were likely made during various carbon combustion and vapor deposition processes, but electron microscopy at that time was not advanced enough to distinguish them from other forms of carbon. The first method for producing CNTs and fullerenes in reasonable quantities – was by applying an electric current across two carbonaceous electrodes in an inert gas atmosphere. This method is called plasma arcing. It involves the evaporation of one electrode as cations followed by deposition at the other electrode. This plasma-based process is analogous to the more familiar electroplating process in a liquid medium. The fullerenes and CNTs are formed by plasma arcing of carbonaceous materials, particularly graphite. 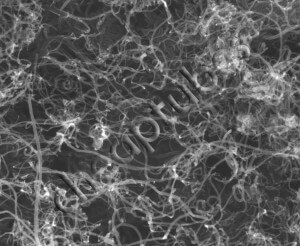 The fullerenes or carbon nanotubes appear in the soot that is formed, while the CNTs are deposited on the opposing electrode. Another method of nanotube synthesis involves plasma arcing in the presence of cobalt with a 3% or greater concentration. As noted above, the nanotube product is a compact cathode deposit of rod like morphology. However when cobalt is added as a catalyst, the nature of the product changes to a web, with strands of 1mm or so thickness that stretch from the cathode to the walls of the reaction vessel. The mechanism by which cobalt changes this process is unclear, however one possibility is that such metals affect the local electric fields and hence the formation of the five-membered rings. The carbon arc discharge method, initially used for producing C60 fullerenes, is the most common and perhaps easiest way to produce CNTs, as it is rather simple. However, it is a technique that produces a complex mixture of components, and requires further purification to separate the CNTs from the soot and the residual catalytic metals present in the crude product. This method creates CNTs through arc-vaporization of two carbon rods placed end to end in an enclosure that is usually filled with inert gas at low pressure. The discharge vaporizes the surface of one of the carbon electrodes, and forms a small rod-shaped deposit on the other electrode. Producing CNTs in high yield depends on the uniformity of the plasma arc, and the temperature of the deposit forming on the carbon electrode. Hipco method is an arc method synthesis method carried out under high pressure and was developed at Rice University to create high quality single-walled carbon nanotubes (SWCNT) from the gas-phase reaction of iron carbonyl with high-pressure carbon monoxide gas. Iron pentacarbonyl is used to produce iron nanoparticles that provide a nucleation surface for the transformation of carbon monoxide into carbon during the growth of the nanotubes. Synthesis produces high quality materials but only in the milligrams range and isn’t commercially scale-able. In 1996 CNTs were first synthesized using a dual-pulsed laser and achieved yields of >70wt% purity. Samples were prepared by laser vaporization of graphite rods with a 50:50 catalyst mixture of Cobalt and Nickel at 1200oC in flowing argon, followed by heat treatment in a vacuum at 1000oC to remove the C60 and other fullerenes. The initial laser vaporization pulse was followed by a second pulse, to vaporize the target more uniformly. The use of two successive laser pulses minimizes the amount of carbon deposited as soot. The second laser pulse breaks up the larger particles ablated by the first one, and feeds them into the growing nanotube structure. The material produced by this method appears as a mat of “ropes”, 10-20nm in diameter and up to 100um or more in length. Each rope is found to consist primarily of a bundle of single walled nanotubes, aligned along a common axis. By varying the growth temperature, the catalyst composition, and other process parameters, the average nanotube diameter and size distribution can be varied. 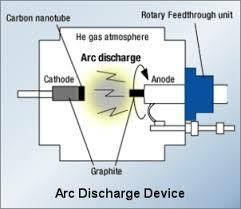 Arc-discharge and laser vaporization are currently the principal methods for obtaining small quantities of high quality CNTs. However, both methods suffer from drawbacks. The first is that both methods involve evaporating the carbon source, so it has been unclear how to scale up production to the industrial level using these approaches. The second issue relates to the fact that vaporization methods grow CNTs in highly tangled forms, mixed with unwanted forms of carbon and/or metal species. The CNTs thus produced are difficult to purify, manipulate, and assemble for building nanotube-device architectures for practical applications. Undoubtedly the most common method of carbon nanotubes synthesis, catalyzed chemical vapor deposition of hydrocarbons over a metal catalyst is a classical method that has been used to produce various carbon materials such as carbon fibers and filaments for over twenty years. Large amounts of CNTs can be formed by catalytic CVD of acetylene over Cobalt and iron catalysts supported on silica or zeolite. The carbon deposition activity seems to relate to the cobalt content of the catalyst, whereas the CNTs’ selectivity seems to be a function of the pH in catalyst preparation. Fullerenes and bundles of single walled nanotubes were also found among the multi walled nanotubes produced on the carbon/zeolite catalyst. Supported catalysts such as iron, cobalt, and nickel, containing either a single metal or a mixture of metals, seem to induce the growth of isolated single walled nanotubes or single walled nanotubes bundles in the ethylene atmosphere. The production of single walled nanotubes, as well as double-walled CNTs, on molybdenum and molybdenum-iron alloy catalysts has also been demonstrated. Methane has also been used as a carbon source. In particular it has been used to obtain ‘nanotube chips’ containing isolated single walled nanotubes at controlled locations. Ball milling and subsequent annealing is a simple method for the production of CNTs. Although it is well established that mechanical attrition of this type can lead to fully nano porous microstructures, it was not until a few years ago that CNTs of carbon and boron nitride were produced from these powders by thermal annealing. The method consists of placing graphite powder into a stainless steel container along with four hardened steel balls. The container is purged, and argon is introduced. The milling is carried out at room temperature for up to 150 hours. Following milling, the powder is annealed under an inert gas flow at temperatures of 1400oC for six hours. The mechanism of this process is not known, but it is thought that the ball milling process forms nanotube nuclei, and the annealing process activates nanotube growth. Research has shown that this method produces more multi walled nanotubes and few single walled nanotubes. CNTs can also be produced by diffusion flame synthesis, electrolysis, use of solar energy, heat treatment of a polymer, and low-temperature solid pyrolysis. In flame synthesis, combustion of a portion of the hydrocarbon gas provides the elevated temperature required, with the remaining fuel conveniently serving as the required hydrocarbon reagent. Hence the flame constitutes an efficient source of both energy and hydrocarbon raw material. Combustion synthesis has been shown to be scalable for high-volume commercial production. Purification of CNTs generally refers to the separation of CNTs from other entities, such as carbon nanoparticles, amorphous carbon, residual catalyst, and other unwanted species. The classic chemical techniques for purification have been tried, but they have not been found to be effective in removing the undesirable impurities. 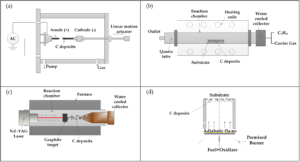 Three basic methods have been used with varying degrees of success, namely gas-phase, liquid-phase, and intercalation methods and more recently, plasma purification. Generally, a centrifugal separation is necessary to concentrate the single walled nanotubes in low-yield soot before the micro filtration operation, since the nanoparticles easily contaminate membrane filters. The advantage of this method is that unwanted nanoparticles and amorphous carbon are removed simultaneously and the CNTs are not chemically modified. However 2-3 mol nitric acid is useful for chemically removing impurities. A typical purification process is as follows: 1kg CNTs in 20kgs of 20% HNO3 solution at 80-90oC for 6hrs, then it is repeatedly filtered, DI water washed, and filtered until the filtrate solution is PH neutral. The CNTs are then dried until the form a cake. It is then broken up into a fine powder. Prolonged sonication will damage the CNTs structure due to the harsh acids being used. It is now possible to cut CNTs into smaller segments, by extended sonication in concentrated acid mixtures. The resulting CNTs form a colloidal suspension in solvents. They can be deposited on substrates, or further manipulated in solution, and can have many different functional groups attached to the ends and sides of the CNTs. The first successful technique for purification of nanotubes was developed by Thomas Ebbesen and coworkers. Following the demonstration that nanotubes could be selectively attached by oxidizing gases these workers realized that nanoparticles, with their defect rich structures might be oxidized more readily than the relatively perfect nanotubes. They found that a significant relative enrichment of nanotubes could be achieved this way, but only at the expense of losing the majority of the original sample. A new gas-phase method has been developed at the NASA Glenn Research Center to purify gram-scale quantities of single-wall CNTs. This method, a modification of a gas-phase purification technique previously reported by Smalley and others, uses a combination of high-temperature oxidations and repeated extractions with nitric and hydrochloric acid. This improved procedure significantly reduces the amount of impurities such as residual catalyst, and non-nanotube forms of carbon) within the CNTs, increasing their stability significantly. chromatography to either separate multi walled nanotubes and unwanted nanoparticles or single walled nanotubes and the amorphous carbon impurities. It is important to keep the CNTs well-separated in solution, so the CNTs are typically dispersed using a surfactant prior to the last stage of separation. An alternative approach to purifying multi walled nanotubes was introduced in 1994 by a Japanese research group. This technique made use of the fact that nanoparticles and other graphitic contaminants have relatively “open” structures and can therefore be more readily intercalated with a variety of materials that can close nanotubes. By intercalating with copper chloride, and then reducing this to metallic copper, the research group was able to preferentially oxidize the nanoparticles away, using copper as an oxidation catalyst. Since 1994, this has become a popular method for purification of nanotubes. Samples of cathodic soot which have been treated this way consist almost entirely of nanotubes. A disadvantage of this method is that some amount of nanotubes are inevitably lost in the oxidation stage, and the final material may be contaminated with residues of intercalates. A similar purification technique, which involves intercalation with bromine followed by oxidation, has also been described. Plasma purification is a more recent method. In addition to purifying the carbon nanotubes in Argon, the plasma process can be used to covalently bond certain functional groups to the nanotubes surface including OH, COOH, NH2, N2, & F groups. 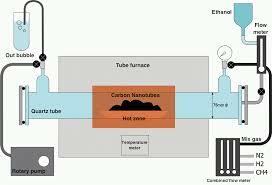 The plasma process also exfoliates the carbon nanotube material making it more easily dispersed. We find that sonicating the mixture for 80% of the total time before adding the surfactant solution can enhance the dispersion effect by first well dispersing the carbon nanotubes prior to the surfacant being added to stabilize it. The reagent polyvinylpyrrolidone (PVP) is a good dispersion agent. Some people like to use the reagent Sodium Dodecyl Benzene Sulfonate (SDBS), Triton 100, or Sodium Dodecyl Sulfonate (SDS). The solution is composed of CNTs, PVP, and water. The required sonication time is 30-60 minutes with an interruption of 30 seconds every 30 seconds to prevent CNT breakage. You must prolong the sonication time accordingly if the power of your ultrasonic equipment is less than that of the SONICS VCX750 unit. Our sister company CTI Materials LLC has a patented dispersion method which utilizes novel nanoscale materials in lieu of traditional surfactants. Not only does it not need to be washed numerous times to remove excess surfactants (which can’t be done), it can be reduced to improve conductivity in the end product. Pristine nanotubes are hydrophobic and insoluble in many liquids such as water, polymer resins, and most solvents so functionalized carbon nanotubes are often used. CNTs are difficult to evenly disperse in a liquid matrix such as epoxies and other polymers. This complicates efforts to utilize the nanotubes’ outstanding physical properties in the manufacture of composite materials, as well as in other practical applications which require preparation of uniform mixtures of CNTs with many different organic, inorganic, and polymeric materials. To make nanotubes more easily dispersible in liquids, it is necessary to physically or chemically attach certain molecules, or functional groups, to their smooth sidewalls without significantly changing the nanotubes’ desirable properties. This process is called functionalization. The production of robust composite materials requires strong covalent chemical bonding between the filler particles and the polymer matrix, rather than the much weaker van der Waals physical bonds which occur if the CNTs are not properly functionalized. Functionalization methods such as chopping, oxidation, and “wrapping” of the CNTs in certain polymers can create more active bonding sites on the surface of the nanotubes. For biological uses, CNTs can be functionalized by attaching biological molecules, such as lipids, proteins, biotins, etc. to them. Then they can usefully mimic certain biological functions, such as protein adsorption, and bind to DNA and drug molecules. This would enable medially and commercially significant applications such as gene therapy and drug delivery. In biochemical and chemical applications such as the development of very specific biosensors, molecules such as carboxylic acid (COOH), poly m-aminobenzoic sulfonic acid (PABS), polyimide, and polyvinyl alcohol (PVA) have been used to functionalize CNTs, as have amino acid derivatives, halogens, and compounds. Some types of functionalized CNTs are soluble in water and other highly polar, aqueous solvents. It is desirable to bond certain chemical functional groups to the carbon nanotube surface to promote dispersion in a specific matrix. When the CNTs aren’t compatible with the matrix you get “islands of CNTs” meaning your dispersion will have alternating clear portions in an otherwise homogeneous solution. The main method of functionalization is by re-fluxing in concentrated acids under heat. This does cause some damage to the sidewalls of the CNTs. This has less of an effect on a multi walled carbon nanotube due as the damage is only on the out walls and the inner walls remain in tact. It can have a dramatic effect on mechanical and conductive properties of single walled nanotubes. Typical chemical functional groups are hydroxyl – OH, Carboxyl – COOH, & Amine – NH2. A recent method is microwave plasma based functionalization. During plasma based purification, certain process gasses are flowed into the plasma reactor which when excited by the energetic plasma forms covalent bonds between the functional groups and the surface of the carbon nanotubes. Typical functional groups are OH, COOH, NH2, N2, & F groups. We hope that his guide has deepened your understanding of Carbon Nanotubes History And Production Methods and inspired you to integrate carbon nanotubes into your existing processes to enhance certain properties or to develop CNT based applications. We are always happy to discuss applications. 4. Wondrous World of Carbon Nanotubes (Internet Reference), M. J. M. Daenen et al. 10. [B.Q. Wei, et al, Appl. Phys. Lett. 79 1172 (2001)].